This is a great little game to have in your collection if you want a 2-player experience, and lighter games like Odin’s Ravens or Lost Cities aren’t really cutting it. 7 Wonders Duel has a solid amount of strategic depth to it to scratch the right itch. Buy your copy from the link below, and we’ll receive a small commission. One of the most celebrated games in the world can now be experienced in a two-player arena. 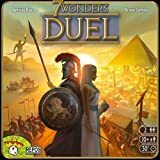 7 Wonders Duel takes the game play and excitement of the original and adapts it for one-on-one battles. Take control of your civilization and decide to invest in science, military or prestige. Two new ways to win will keep you on your toes and watching every move your opponent makes. If you fail to build defenses your capital city may be destroyed, but ignore technology and your people may be left in the dark ages. It’s a constant tug of war. 7 Wonders Duel is an exciting new way to play the game that took the world by storm. Great for both fans of the original and those new to the hobby.